Daily Illuminator: The Warehouse 23 Holiday Sale Ends Today! 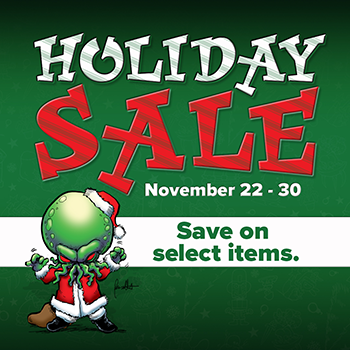 November 30, 2017: The Warehouse 23 Holiday Sale Ends Today! Our temporary, turkey-induced insanity is fading, so the prices on Warehouse 23 are about to return to normal! This is your last chance to get in on the Holiday Sale, ending tonight. This is the perfect time to pick up some gifts at an absurdly low price. Plus, each U.S. order over $100 gets free shipping! And, of course, we throw in some extra promo swag, just for Santa. You can pick up almost anything you're looking for at a discount, some up to 75% off! And don't forget we have our GURPS Archive and GURPS Traveller Mystery Bundles available, as well as our Munchkin Holiday Grab Boxes! If you like to take a chance at some random games for a low price, these are a great deal. If you happen to get something you already own, you can always gift it away! Make sure you get these deals before tonight, because our elves are getting impatient, and turning the sale off soon! Oh no, I called the Warehouse 23 staff "elves" again, they're going to hate that. They're actually gnomes.